“In God We Trust” also appears above the Speaker’s Rostrum in the House of Representatives and which the majority of Representatives ignore on a regular basis. Second, the First Amendment forbids Congress from establishing a religion or prohibiting the free exercise of religion. Declaring that the nation trusts in God is not an establishment of religion. It’s an acknowledgment that God is the ultimate sovereign. If God is not the ultimate sovereign, then who or what is? The State? Third, the existence and acknowledgment of God protects atheists because it stops the State from becoming a law unto itself. If that happens, there is nothing to stop the State from becoming a tyrant and enforcing its own mandates on everyone regardless of creed or lack thereof. While the Bible declares an atheist to be a “fool,” there is no negative civil sanction imposed on atheists. Do we have any proof that the founders espoused a view of “nonreligion” as Justice Scalia described what Europe has adopted? Look how that’s working out that Islam will soon be the majority religion that will wipe out all dissenters. On September 25, 1789, the day that Congress approved the First Amendment to the U.S. Constitution, Congress resolved to direct a committee to “wait upon the President to request that he recommend to the people a day of public thanksgiving and prayer to be observed by acknowledging with grateful hearts the many and signal favors of All Mighty God, especially by affording them an opportunity peaceably to establish a constitutional government for their safety and happiness.” Washington issued the proclamation on October 3, 1789. 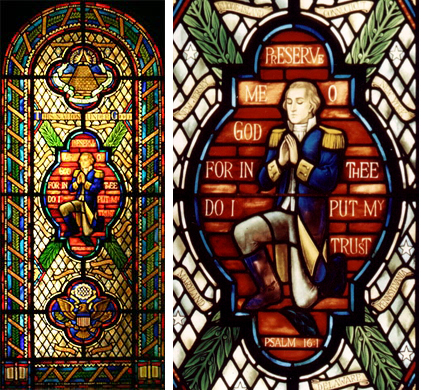 A paid chaplain system was instituted by Congress in 1789. The first Congress declared that “two Chaplains of different denominations . . . shall interchange weekly.” The House chose William Lynn, a Presbyterian minister from Philadelphia, as its first chaplain, and the Senate picked Samuel Provoost, Episcopal bishop from New York. The chaplain system is still in effect. But let’s be honest, in terms of America’s laws and policies, God has been rejected as the “Supreme Judge of the world” as the Declaration of Independence describes it. And that’s a problem. Yes, we can find examples of government pronouncements that we are “one nation under God” and “In God We Trust,” but is it really so? Does America really trust God? America trusts its own version of god, and in most cases it’s the State. Even people who believe in God have become willing wards of the State: “Where your treasure is, there your heart will be also” (Matt. 6:21.) The majority of Americans prefer free stuff from the State, money that has been stolen from some citizens and given to others. Recently, the Ohio Supreme Court ruled 4-3 supporting the “firing of an Ohio science teacher for insubordination because he refused to remove ‘religious materials’ from his classroom, including posters of President George Bush and Colin Powell praying” even though the Constitution states that it was drafted “in the Year of our Lord” 1787. Is the Constitution unconstitutional? Not only are we not a nation under God’s favor, but we are a nation that has made it a point to disavow the religious past that made America great. We’re doing this to our own peril. “Do not be deceived, God is not mocked; for whatever a man sows, this he will also reap” (Gal. 6:7).